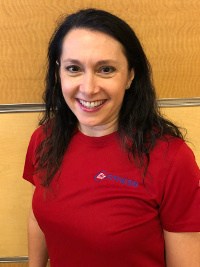 24 Hour Fitness Personal Trainer Bio Lisa A. If you have a fitness goal, let's talk! I journey with people to their mountaintops moments in fitness. At age 28, I had a dream: to compete in the U.S. Figure Skating Association's Adult Nationals. Getting up at 4am for ice time was not easy and I got frustrated many times along the way. If it were not for the encouragement and expertise of my coach and trainer, I never would have set foot on the competition ice. Regardless of what happens in my life, no one can take the euphoria of that moment from me of placing in the competition. Years later, my priorities shifted from exercise to my stressful, 80-hour a week finance job. After 2 years of no exercise, I was embarrassed to step foot in a gym. The energy and encouragement from the instructor helped me return for a second class. My second mountaintop moment was losing the weight and performing again on a stage in Times Square. I became a personal trainer because I want to be there to help people toward their fitness goals like those who were there for me when I needed them. Whatever your goal, I believe in you and together we can get there.